I’ve always wanted to paint a Hibiscus, so when an opportunity came up this month to do one I couldn’t refuse. 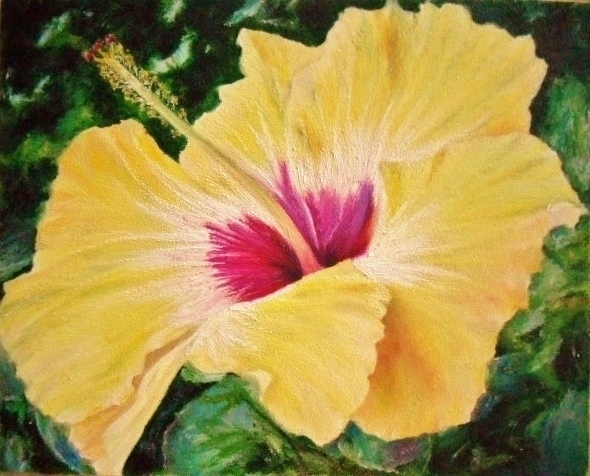 To my eye, Hibiscus are stunning flowers, from form to coloring – they are perfect subjects for oil pastels. I’m not sure why it took me so long to paint one. For this painting I did an acrylic underpainting, that provided great coverage to the surface. It allowed me to get a handle on the shapes, as well as laying in correct values. I really enjoyed working on this painting and Yellow Hibiscus (8×10) is a first in what I expect will be many more to come. Oh, I love the folds. Really lovely. I love the softness you’ve created using OPs. Hi Mona, thanks very much – wonderful to hear from you. I love your work and you’re an inspiration to me. Hi Vickie, it’s so nice to hear from you. Thank you very much for your kind comments, they mean a lot and are appreciated. Thank you Stephen – I appreciate it! This is beautiful. If I didn’t know better I’d think it was a photo. Thank you very much for your lovely comment and compliment – much appreciated! Thank you very much Annie for your nice comment – it was a great subject to paint, especially with oil pastels. Thank you for visiting my blog. Thanks Petronette, I appreciate your lovely comment! Thank you so much, I appreciate your comments!! this is about the fourth time i’ve been online today, and we keep losing the signal – nothing is sent out! i am finally home – or almost home, and now at one i the morning i think this will go thru! it’s amazing.. wonderful! you are amazing.. wonderful! i looked for something i sent four or so days ago and cannot find it so i assume some of my comments have not gone thru either. yikes! sigh. will resume when i am home in the afternoon. Oh man, you’ve really have had the computer problems of late – right? Here’s the deal, people understand that you are in an area where coverage is going to be spotty. None of us are going anywhere – so to receive any comment from you is pure pleasure. Thank you so much for your thoughts and wonderful comments. You are appreciated! HI Patricia, thank you very much – you are so kind! This was a fun painting to do. I agree Magenta (my favorite) and yellow are the best together, love working with them. Oh my dearest Violet, you just made my day all the more brighter! Thank you so much for your generous comments – so glad you enjoyed this piece! Oh I truly love this!! Thanks so much Cindy, with all your gorgeous flowers it doesn’t surprise me that you’d connect with this piece. Really appreciate your wonderful comment! Wow Scott beautiful writing and much appreciated, makes me look at the painting in a whole new way. Keeping the background simple with shapes and forms gave the flower its prominence. If I didn’t know better I would have said this is a photograph. this is so picture perfect. Well done Mary. Hi Emily, thank you very much! I found that oil pastels are perfect for close-ups with flowers, especially Hibiscus with its ruffled edges. When this beautiful hibiscus came up on my screen I thought is was a photo. Now I see that it’s even better. HI Elena, thank you very much. My camera work has much to be desired, because the whites of the interior of the flower didn’t show up quite as white as they actually are – really appreciate your comments! I thought it was photo at first, too. You have the colors and texture perfect for the flower petals and stem and for the leaves. Magical!! Hey Cyndi, so funny! Thank you for your generous comments – it was fun developing this painting. Between the colors and texture, this was right up there as one of my favorites to work with. Thank you so much and appreciate your kind and thoughtful comments! beautiful the texture and color are just amazing, good job! Hi Doris, thank you so much – I was surprised that I was able to get that much texture in this piece. Thanks for noticing! What a vibrant and beautiful hibiscus, Mary! Thanks Marina so sweet – I really appreciate it! Amazing details! Hibiscus – one of my favorite flowers that grow so well here. You should have painted one before. You’ve made my day – thank you for your encouragement and wonderful comments! Whoa… when I first scrolled down, I wondered where the painting was; it’s so realistic it looks like a photo! Amazing! Oh Mamie, you’ve given me a great laugh this afternoon! Thank you very much for your wonderful comment. I’m still smiling! So beautiful! I love the colors you chose. Thank you so much Jessica – really appreciate receiving your comment! Thank you, means a lot to receive your comment! Hi Benjamin, so kind of you – thank you very much! Your welcome, it is lovely.